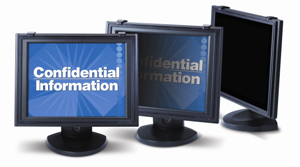 Keep your on screen data confidential while on the move. Microlouver technology prevents viewing of on-screen data from either side of the monitor. Only someone seated directly in front of the screen can see what's displayed. Attach easily - filter can remain in place, even when cumputer is closed.